Do We Really Want To Be The Evil Overlords? Rio Tinto’s chief office building towers over St Michael’s Cathedral on Collins Street, Melbourne. The people who worship at St Michael’s do not live in fear that one day Rio Tinto may take their sacred land in order to enrich company stockholders. They do not worry that their lovely cathedral will be knocked down for mining. However, we would all do well to think about what that would feel like. Such a grab when done without consultation or permission would represent the destruction of a people’s culture and history. St Michael’s is a place where people for generations have been married, had children baptised, and grieved when family and friends have died. This space is a special container for love, family, community, and humanity. For any number of people its senseless obliteration would feel like the violation of a family member. This is what the original peoples of Australia feel when they are displaced for “the greater good” of white Australia. This is also what the original peoples of North America feel when our Australian company invades their land, destroying sacred space and the environment, in order to mine the copper discovered there. Right now in Oak Flat Arizona, Rio Tinto is planning on obliterating sacred Apache land. As part of Resolution Copper Mining they will hollow out a vast chamber in Oak Flat park area that, when it caves in, will leave a two-mile-wide, 1,000-foot-deep pit. People are concerned about water contamination from acid mine drainage. Exposure to chronic high levels of copper will increase risk factors for lung cancer and coronary heart disease in their community. These are in addition to losing a place of great meaning to them: a place where they would sing songs, dance, and initiate their young people. How did Rio Tinto get this land? It wasn’t through purchase, it wasn’t through consultation with those people who have used that land for hundreds of years. It was handed to them by the US federal government when it was put onto a “must pass” military spending bill as a rider. Not even the general US public had a say in this. Does Australia really want to continue a tradition of destroying lands and peoples for the temporary profit of our wealthiest? When did we decide it was okay to continue colonialist policies of smash and grab? The mining companies are walking all over everyone’s posterity both environmental and cultural. This has to stop, and it is up to us to do it. This weekend the Apache are holding a massive sit-in at Oak Flat celebrating one year of their protest occupation. 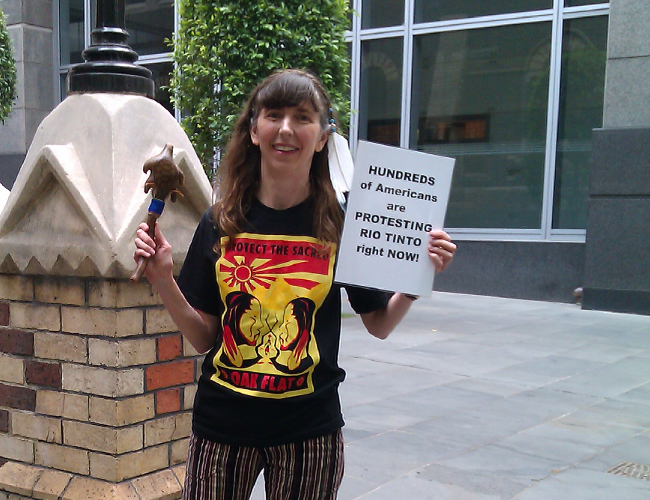 Today I stood in protest outside the Melbourne Rio Tinto offices. Perhaps others would like to support the effort. Australia doesn’t have to be the bad guys, we don’t have to act like evil overlords.